The Parameter-less Population Pyramid (P3) uses a novel population scheme, called the population pyramid. This population scheme does not require a fixed population size, instead it keeps adding new solutions to an ever growing set of layered populations. 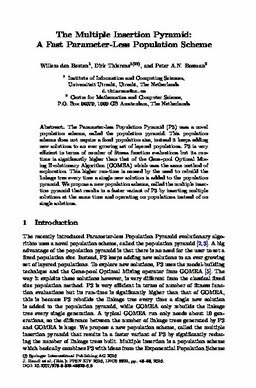 P3 is very efficient in terms of number of fitness function evaluations but its runtime is significantly higher than that of the Gene-pool Optimal Mixing Evolutionary Algorithm (GOMEA) which uses the same method of exploration. This higher run-time is caused by the need to rebuild the linkage tree every time a single new solution is added to the population pyramid.We propose a new population scheme, called the multiple insertion pyramid that results in a faster variant of P3 by inserting multiple solutions at the same time and operating on populations instead of on single solutions.